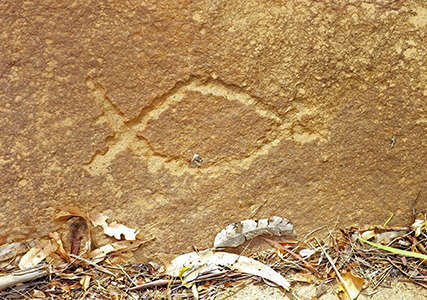 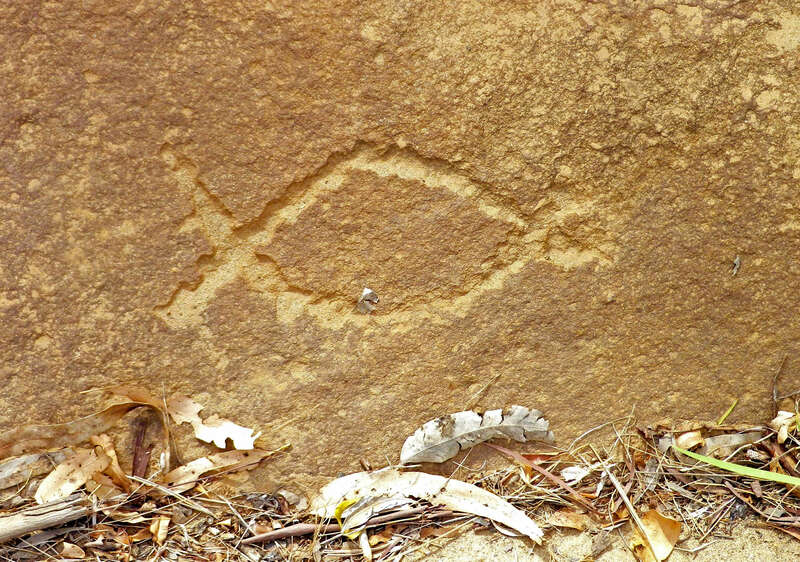 Fish shaped engraving on a near vertical surface. This engraving on a horizontal surface is difficult to interpret, but may be an outline of two axes with handles. False colour image on the right for better contrast. 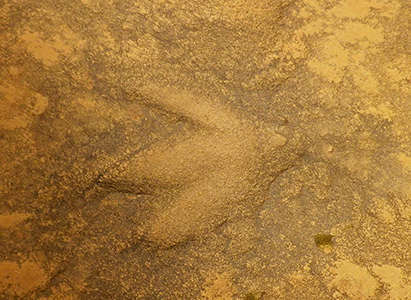 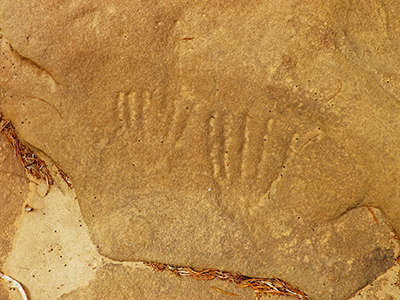 This engraving on a horizontal surface appears to be a bird's foot, possibly an emu. 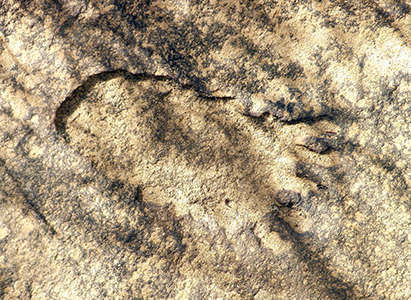 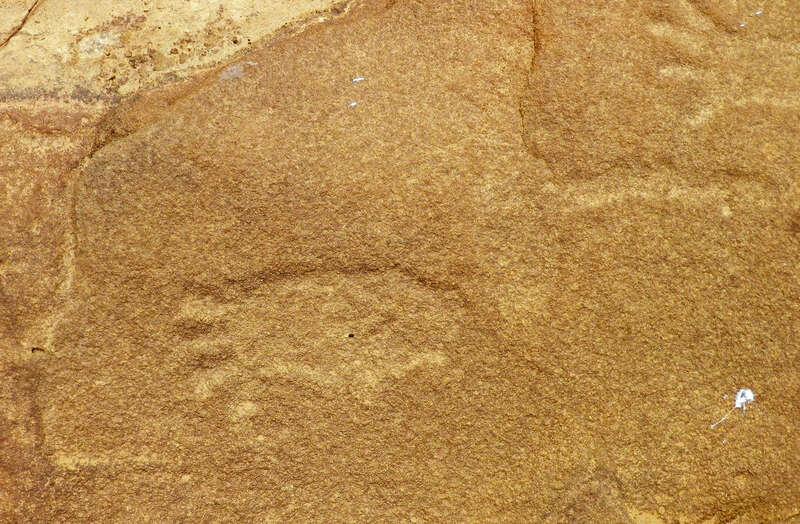 This engraving of either a human foot or a fish or a yam is of the 'cookie cutter' type, which occurs when the rock patina is cut through in an engraving, exposing a softer stone beneath, which preferentially weathers. Yam engravings, the photos centre and right in false colour to create better contrast. 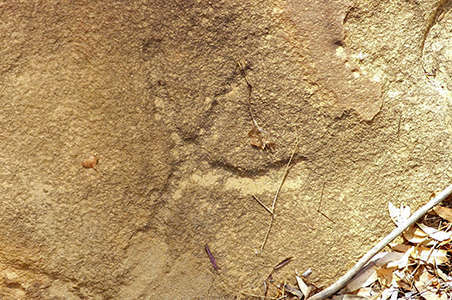 Yam engravings, close up of the image above, the photo on the right in false colour to create better contrast. Yam engravings, the photo on the right in false colour to create better contrast, probably a continuation of the engravings above. 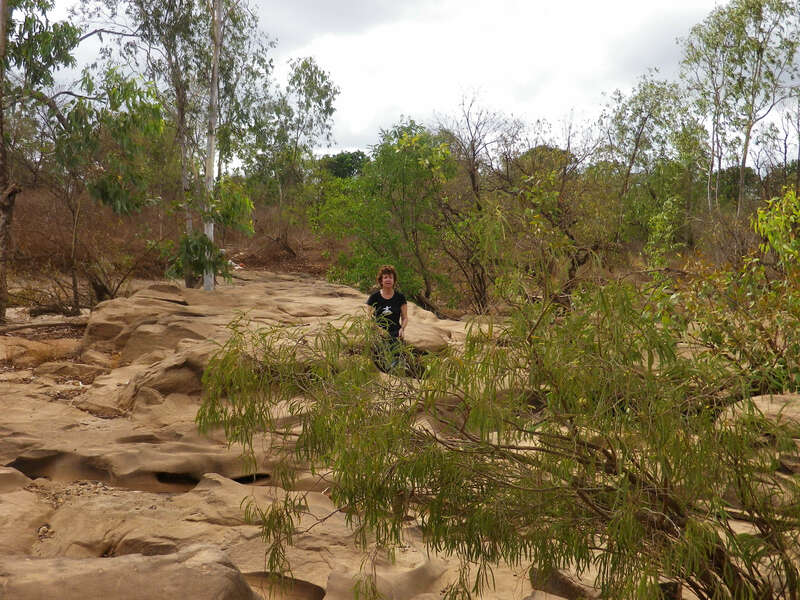 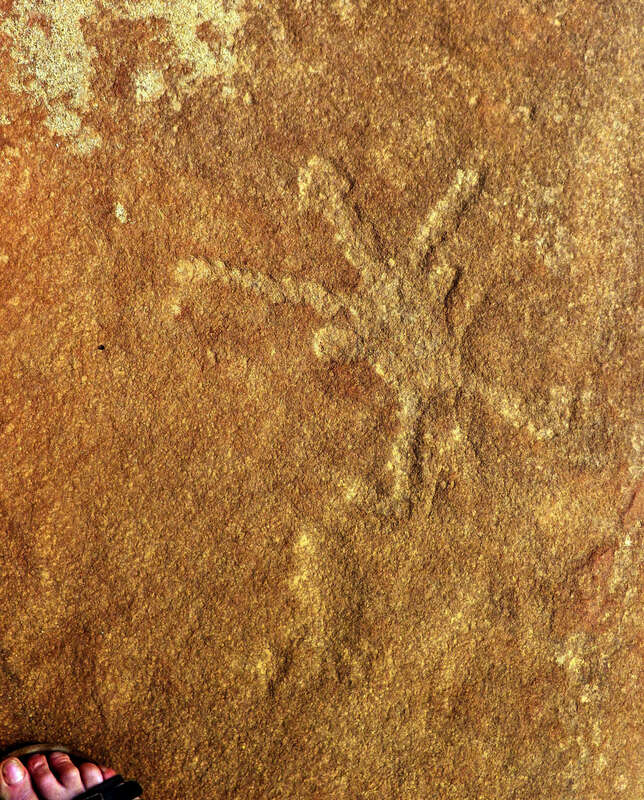 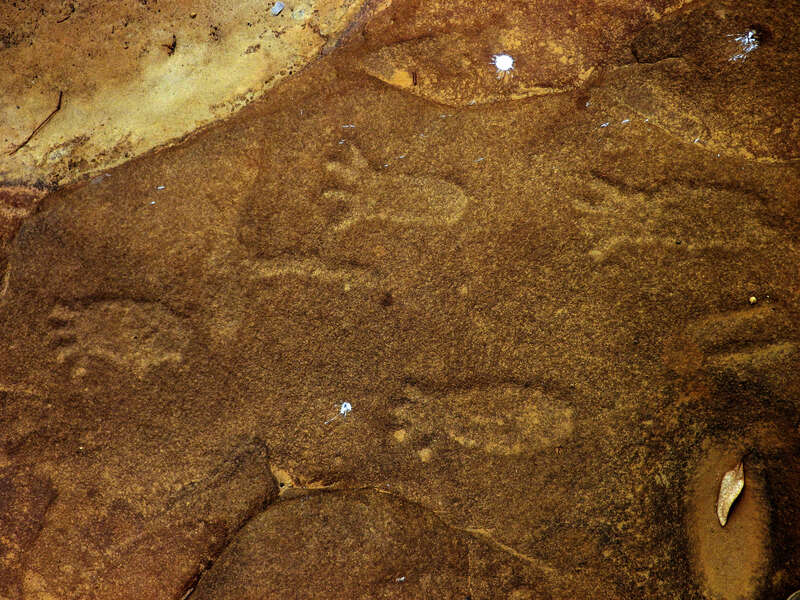 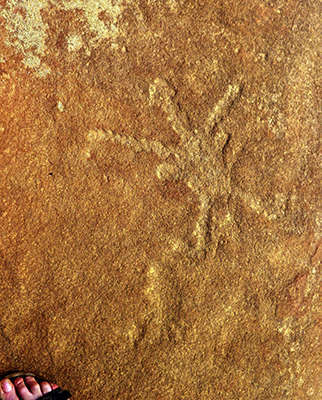 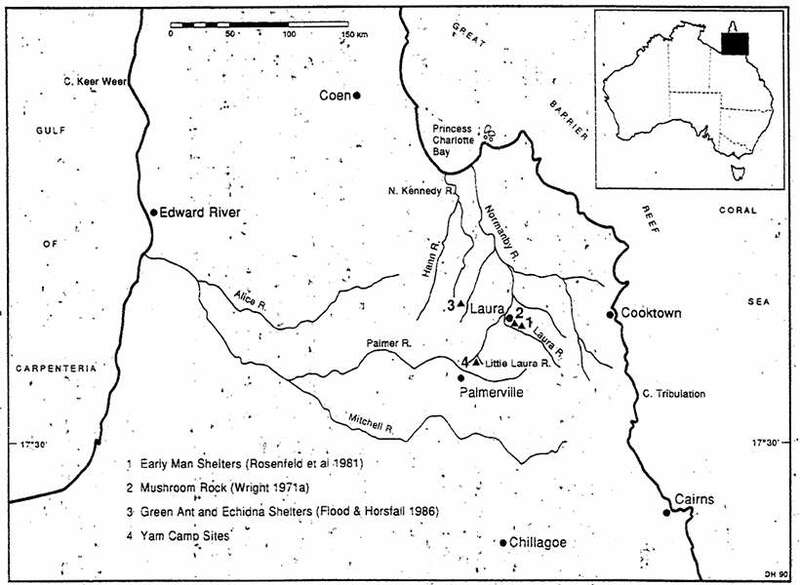 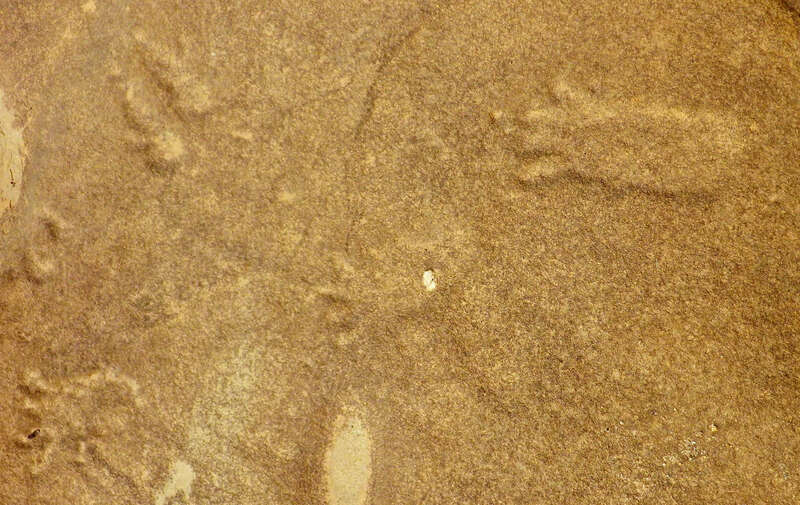 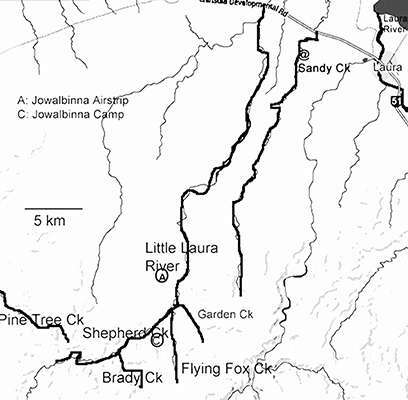 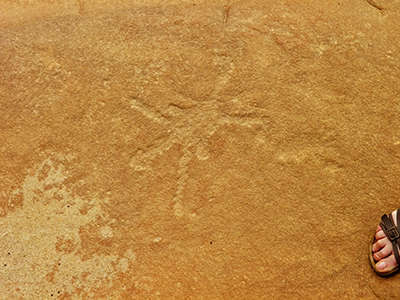 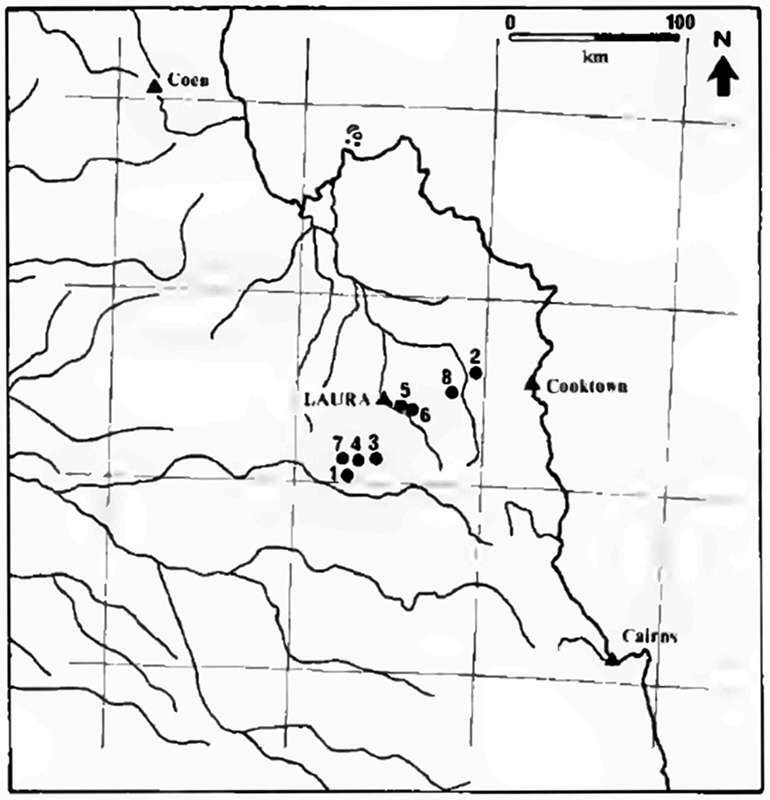 Note the kangaroo prints at top left of the image. Yam engravings (or possibly heads with rays), the photo on the right in false colour to create better contrast. 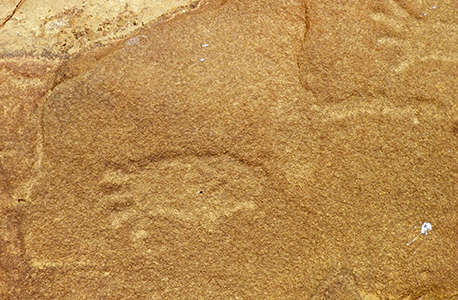 This is the large area of stone in which the engravings occur. Engraving of an emu track, the photo on the right in false colour to create better contrast. Engraving of what may be a human, or quinkan, female, head down as shown in the image, with a very long neck. 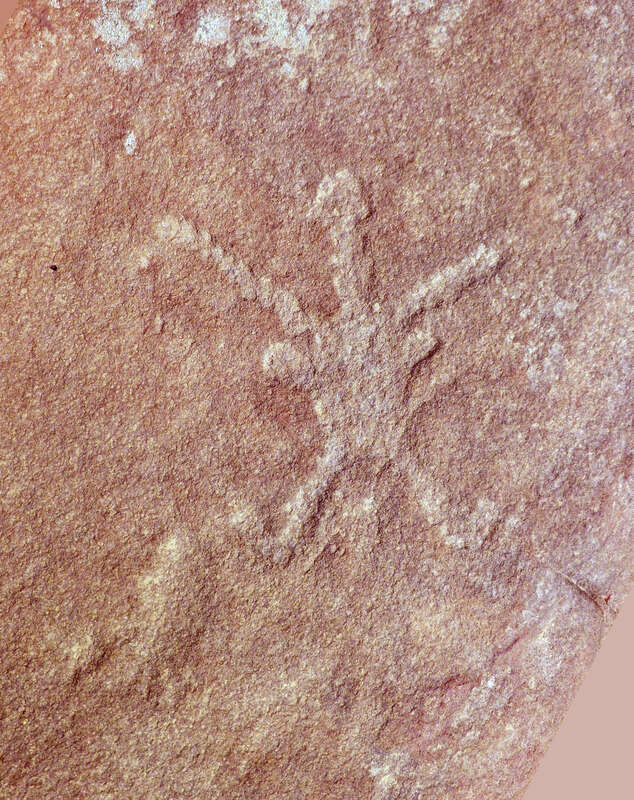 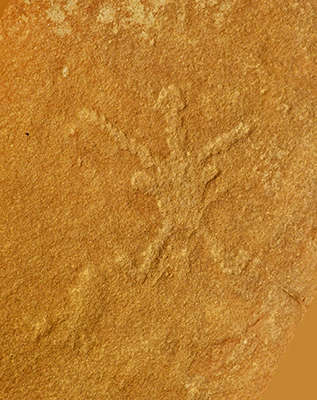 This is the above engraving rotated so that the figure may be more easily examined and interpreted. 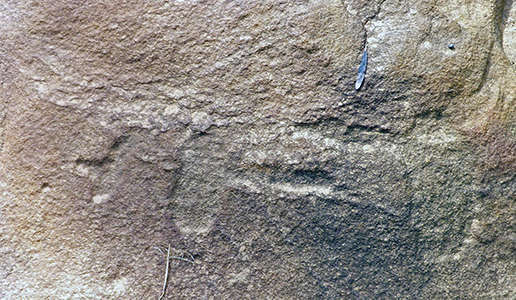 In this view, and in the false colour views centre and right, we can see that it is female, and is almost certainly a quinkan figure with a very long neck. 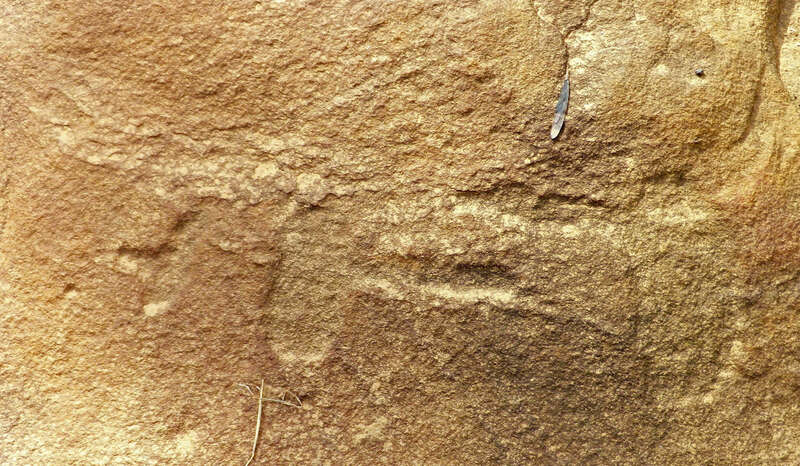 In addition, to the bottom left in this view, is what may be an engraving of a yam.